’tis the season of thanks, and here at Growing Places, we have so much to be thankful for this year. We are continuing to grow as a company and have added some fantastic therapists to our team. Many of our patients have seen great success this year and we are so grateful to play a part in those achievements. We asked our therapists to share with us what they are thankful for and received some really great responses. I have so very much to be thankful for for being a therapist I’m not sure where to begin. I feel lucky and privileged to have a job where I can, hopefully, improve the lives of others. I do not take this for granted at all. I feel that families with children with special needs already have many hurdles to overcome, so if I can make things a little easier, give them comfort, help them to share in the little or big triumphs for their kids, then I have done my job. I see what I do as so much more than strengthening, or stretching, or helping achieve developmental milestones. Many times I am a shoulder to cry on, someone to hug and share joy with, a social worker, someone to help navigate endless paperwork or a difficult and confusing medical system, or help share many wonderful programs that are in the community. I wouldn’t trade my job for anything. It has become a passion and I truly love it every day. I am thankful that I have the physical ability to get out of bed each day and work with these wonderful children and families. What they give back to me is a hundred fold of what I give to them. I am truly blessed! 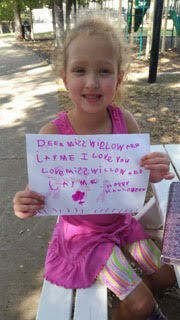 My job humbles me, and I am in awe of the children and families with whom I work. I am the speech therapist of some of the hardest-working, most courageous, and most fun people I know. I work with families who face the unknown with grace, determination and hope. I work with children who seemingly have to climb a mountain in the dark to utter their first sound or word and who are willing to climb that mountain again and again to move forward. The best part of my job, and what I am most thankful for, is that I get to play a small role in the lives of these amazing people, my patients and their families. I am so thankful for a career that is so rewarding. Whenever I hear a parent excitedly say “My child said ‘mama’ for the first time!” or “My child clearly articulated his sister’s name.”, I am so happy that I chose this career. These kids work so hard to overcome challenges and have inspired me to work hard through challenges as well. I am thankful for all of the families who have let me into their lives and to meet their little fighters. I am constantly amazed at the strength and love given to their children and families. For every family I have shared my knowledge with, I have learned something from them as well. Whether it is a new technique/strategy (man, parents are smart! ), a new way to adapt and be strong in a crazy situation, or how to keep it all together and manage stress. Make it a point to tell the children you work with that they matter, that they are good and that YOU are proud of them. Proud of her monkey bar success! As a therapist, I’m always grateful for the opportunity to provide solutions for each child and family, and to design novel experiences that engage that child’s imagination and motivation. There isn’t a day that goes by that I don’t reflect on my gratitude of the sheer joy of playing with children in ways that change their ability to be successful. One of my patients’ had a goal to use the monkey bars. We did upper body strengthening for two and half months during each sessions – 15 modified knee push ups and 15 tricep lifts – and two weeks ago, we tried the monkey bars: She did it! She was able to complete two sets of climbing across with minimal support! The look of triumph on her precious little face was unforgettable and for that I’m grateful. I am so thankful for all of the kids and people my profession has allowed me to work with. A week does not go by that I don’t say “I am so lucky to get to do what I do”. Each person I meet and work with has so much to offer and continues to enrich my life daily. I say with all seriousness that I am especially thankful for the opportunity to work for Growing Places. I have not worked for a better company as a therapist or not. My heart is full. I have the unique position of being on both the patient and provider side of therapy. My son currently receives Physical Therapy from GPTS therapists and has seen them since he was about 8 weeks old. 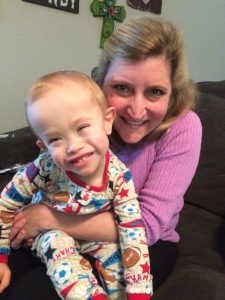 He turned 3 this summer and has made huge progress with the support and guidance of his wonderful therapists. 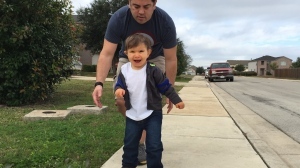 He’s recently started walking independently and the sheer pride on his face and the faces of his therapists for his success fills my heart more than they could ever know. In the past year, I’ve learned so much about each of the therapists who work for Growing Places. I have always loved our therapists, but now that I have had the opportunity to work for this company, I’ve learned that ALL of the therapists are simply amazing. The amount of love and passion these guys have for their job and the families they serve is incredible. I’m thankful to have a job that gives me the flexibility to adjust my schedule around my son’s therapies and specialist visits. I’m also grateful to be able to pay-it-forward by matching families with therapists and providing them with resources to care for their children. I know firsthand that raising a child with special needs can be very difficult at times and I hope that we can help ease the hard times by providing quality care and support. 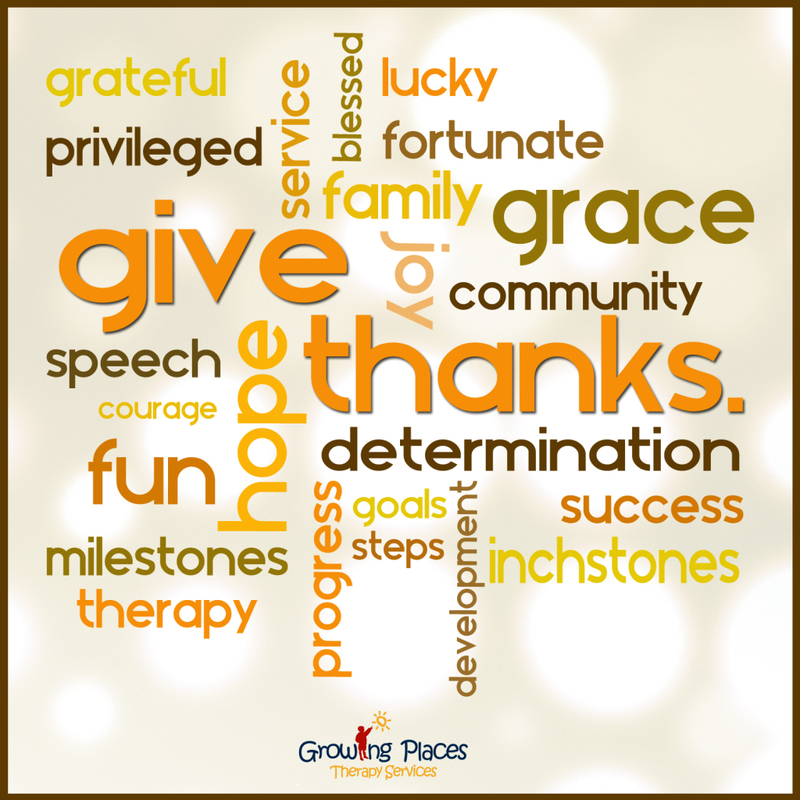 From the Growing Places Therapy family to yours, we wish you all a very Happy Thanksgiving! Thank you for letting us be a part of your child’s lives.